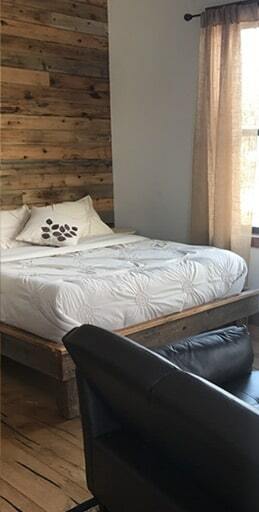 The Grizzly Den is a 450 square feet studio in the heart of Wonderland offering a Queen sized bed with a custom mattress and plenty of natural light. The reclaimed wood, 10 feet high ceilings and clean lines gives it an amazing sense of space. There’s lots of closet space to store all your gear for days in Yellowstone in the Grizzly Den too. Some of the amenities you’ll enjoy after a full day of exploring Yellowstone are: full kitchen, full bathroom, dining area, oak floors, reclaimed wood furniture, HD flat screen tv and cable, air conditioning and free wifi. If you don’t feel like cooking, take advantage of Wonderland Cafe located on the main level. We offer a bakery, barista, 3 meals a day of delicious cuisine and your favorite beers and wines. Enjoy a latte on the patio and plan your adventure!